One of the neatest awards given in the children’s books category is the Children’s Choice Book Awards. It’s the only award voted for by children! There are five nominations for kids to choose from in the Book of the Year K-2nd category. Other categories include 3rd-4th, 5th-6th and teens. Here’s this year’s ballot for the K-2nd Book of the Year category. Which book would your child choose? Head over to the Children’s Book Week for official voting in all categories. Voting ends May 9 , 2013. Every awards event needs a party! So, roll out the red table-cloth and let’s have a Book Gala Picnic! First decide on your guest list. We invited our furry stuffed animal friends. 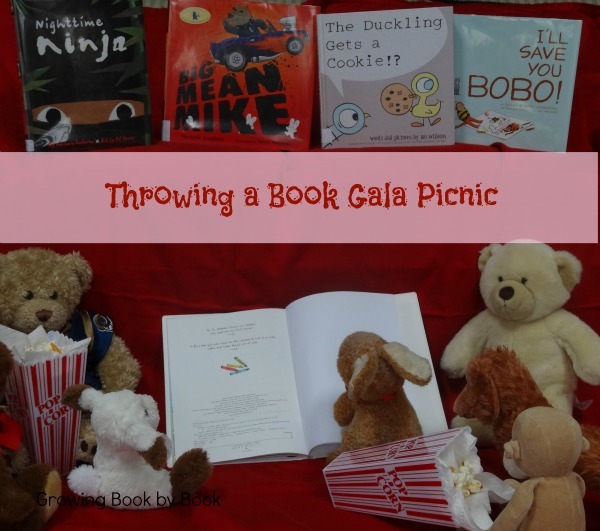 A great writing activity would be to create invitations to your Book Gala Picnic. Next, your picnic will need food to represent each book! Lay out your red table-cloth and have the nominees take their seats. All of the guests can sit in the audience. During your meal, have someone read each of the nominated books. Now it’s time to vote. Pass out a ballot with each book listed. Younger children may need a picture icon of the front cover of each book. Have everyone vote and place their selection in the ballot box. Read the votes and announce the winner. Celebrate the winner with an encore reading of the book! I’d love to know which book won at your party. Please let me know. Happy reading! *Please see the linky directory at the bottom of the page to see where this post has been linked. Great, I just love that the kids get to vote for this winner! It was so much fun Melissa. I’d love to hear how your party turns out. I think it would be fun to do in January too when the Caldecott is announced. I love your blog! Great content that I’ll be watching on behalf of my grandchildren! It is also very beautiful! Pam, thank you so much. I hope you will lots of inspiration here.